We have asked Lexington native and StyleBlueprint contributing writer Lindsey McClave to give us advice about how to really experience Keeneland the right way. For those of us not familiar with this beautiful Lexington, KY, track, this is a great guide. Sure, the most exciting two minutes in sports takes place on the storied turf of Louisville’s very own Churchill Downs. However, for those who have had the pleasure of basking in the light of a sunny day at Keeneland, nearly all will agree: it represents the very heart of horse country, the soul of what makes Kentucky Kentucky. We’re in the happy throes of another fall meet in the Bluegrass. This year’s Keeneland festivities culminate with the Breeders’ Cup at the end of the month, putting a big fat cherry on top of another October spent with the world’s best thoroughbreds. While tickets to this crowning event may be harder to come by, there are still a few precious days remaining to try your luck and to enjoy the beauty of Keeneland. Whether you’re a regular with box seats or a Keeneland newbie looking to get lucky, we’ve outlined the classic experiences not to be missed during your visit. Open year-round to visitors, you’ll be hard pressed to find a more relaxed and up-close look at the historic grounds of Keeneland than in the morning, when jockeys, trainers and thoroughbreds wake up at the break of dawn for morning runs. Arrive extra early—training takes place from 6 a.m. until 10 a.m. Enjoy breakfast at the Track Kitchen, located in the barn area next to the black water tower before watching the horses round the stretch in the early morning light. For more information on this, click here. Two hands are required when at the track—one for the racing form and the other for your cocktail. With a full bar at every turn, there is a libation for everyone. 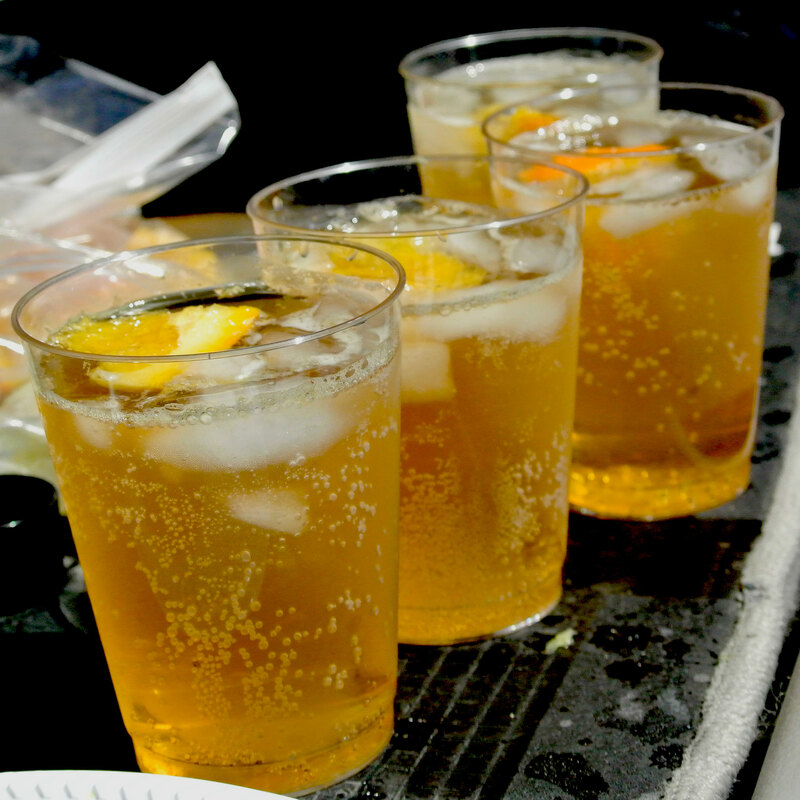 However, you will see most racegoers sipping on the Keeneland Bloody Mary, made with Major Peters’ mix and Grey Goose, and the Keeneland Breeze, a bourbon concoction (obviously) served over ice and spiked with orange liqueur and ginger ale. Both of these cocktails are ideal for toasting bets won and offer comfort when the races aren’t finishing in your favor. A Keeneland day isn’t complete without one in hand. One of Keeneland’s most signature traditions is the tailgate, when racegoers arrive early in the day to eat, drink and be merry prior to the first call to post. Referred to as The Hill, the designated tailgating section is accessed via Gate 1, and there isn’t any charge for partaking in the festivities. Fridays and Saturdays of this meet will be extra lively, with a wagering tent, local food and local music. Next time you venture east, pack your corn hole set and a cooler. Keeneland is an all-day party that just happens to have horse racing. Go to the paddock between races. The paddock is where the race really begins, horses paraded one by one for owners and spectators alike, giving everyone a firsthand look before they make a wager on the winner. The paddock is an intimate affair and a common gathering spot between races. This is also a key area to see and be seen, a public office of sorts for the trainers and owners, and a can’t miss for any true horse lovers. Review your race form and head to the paddock to pick your pony before they hit the track. It makes the entire racing experience that much more fun. Don’t miss the gift shop! This isn’t your ordinary souvenir shop chock full of generic, branded paraphernalia. No, Keeneland’s gift shop is lined with designer wares of the upscale Southern variety: Barbour jackets, Vineyard Vines ties and Longchamp bags peppering the walls and tempting visitors’ wallets. Smaller trinkets are available, as well, along with plenty of platters, julep cups and rocks glasses for entertaining. The shop is located within the historic stone walls of the track and is open year-round. Make sure to duck in for a peek during your visit this meet and add it to your list of places to shop for holiday gifts. There is something for everyone! Dine at Holly Hill or Wallace Station on the way home. We suggested five fabulous restaurants in Lexington last week, and here are a couple more options to hit up on your way home. Chef Ouita Michel has cemented her place in the Kentucky culinary landscape, operating a number of restaurants in the region that are as renowned as they are delicious. Wallace Station and Holly Hill are a hop, skip and a jump from Keeneland and an easy stopping point on the drive back west. Wallace Station, in Versailles, is a reclaimed country store serving homemade sandwiches and Southern sweets. Holly Hill, in Midway, is a fine dining iteration, where Chef Ouita has earned numerous nods from the James Beard House. There isn’t a better way to toast your perfect Keeneland day than with the expertly crafted Kentucky cuisine of Ouita Michel. Lunch at Wallace Station makes everyone happy. Don your Southern best, pack a cooler and corral your friends. Fall is fleeting, and the Keeneland meets are never quite long enough. The majesty of this signature slice of the Bluegrass awaits through the end of the month. Keeneland is located at 4201 Versailles Road, Lexington, KY, 40510. Learn more at (859) 254-3412 or visit www.keeneland.com. Tickets may be purchased here.